BEIJING -- Rescuers were racing against time on Saturday to reach 40 miners buried underground in two separate coal mine disasters which have already killed three people in south China. Work crew operated at least 17 pumps at Niupeng Mine in rural Guizhou Province to release water from the flooded mine before rescuers could be sent down the pit. 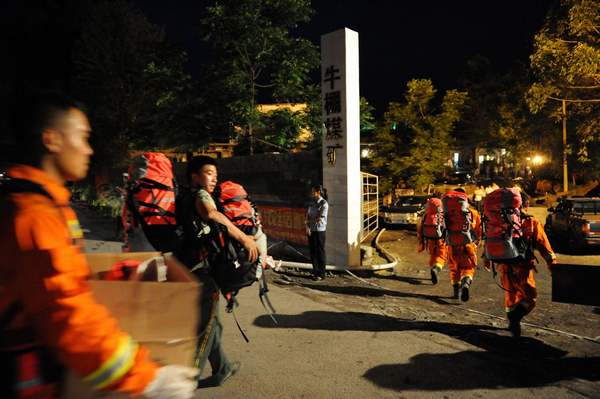 Over a thousand police, firemen, and para-military have been mobilized to join the rescue, said Mao Youzhi, head of the county government of Pingtang, where the coal mine is located. The flooding occurred at about 9:30 am Saturday when 29 miners were working at two shafts of Niupeng Mine. Eight workers have already been back to the ground safe, the official said. In a separate mining disaster, three people were killed while 19 others remain trapped after part of a coal mine in Guangxi Zhuang Autonomous Region collapsed. The miners were buried around Saturday noon when rain-saturated earth on the surface collapsed into a shaft, said Meng Qingguan, head of the work safety bureau of Heshan, where the mine is located. Meng blamed days of heavy rain for the cave-in. A rescue team started to clear the mud-stuffed shaft of the mine Saturday night after work crew used pumps to reduce the level of highly-explosive gas in the shaft. Xinhua reporters saw a big hole, about 30 meters in diameter and 50 meters deep, on the surface of the mine. Rescuers said it is difficult to reach the miners, trapped at a depth of 390 meters, because the size of the cave-in earth was huge, or about 7,000 cubic meters. Another 50 miners who were working underground at the time of the cave-in have managed to escape. Guo Shengkun, Communist Party chief of Guangxi, has ordered a region-wide inspection to ensure the mines are still safe to operate after the torrential rains. Gas explosions, floods and fires were frequent occurrences in China's coal mines. The State Administration of Coal Mine Safety data show 2,433 miners were killed in coal mine accidents in China in 2010, compared with 2,631 deaths in 2009. The casualty of coal mine disasters was on the decline over the past few years after the government put in place a series of strict rules to ensure mining safety. China relies heavily on coal to power its massive economy. Lured by huge energy demands, mine bosses were frequently found forcing workers to boost mining, defying safety rules ordered by the government.